The Market House, on the corner of Church Street and High Street, in Ripley town centre. The building, known as Market House, on the corner of Church Street and High Street, sits opposite the market place and is currently vacant. 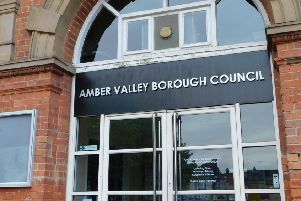 Now Amber Valley Borough Council is looking to develop the empty three-storey plot into nine flats. The development would also include the retention of a ground floor shop unit. It has secured funding from Homes England, a government organisation, for £170,000. A council spokesperson said that this would be contributed towards the overall cost of the scheme. The building was previously home to one of Derbyshire County Council’s area education offices. This provided space for its social workers and educational psychologists. The project is currently in its early stages and would require a formal planning application to push through. In line with local government legislation, these plans will have to come before the council’s own planning board for a final decision.